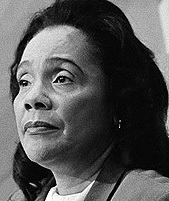 JANUARY 15, 2010: Thirty-eight years ago -- on Jan. 14, 1972 -- Coretta Scott King visited with 2,000 young inmates on Rikers Island in ceremonies observing what would have been the 43rd birthday of her husband, slain civil rights leader Rev. Martin Luther King. Mrs. King, accompanied by singer Harry Belafonte, participated in a program at the Adolescent Remand Center that celebrated the life while mourning the death of King only four years earlier. "We hope from this afternoon's program that you will be inspired and maybe go on to join the great struggle for freedom, justice and equality that my husband led and and which is continuing in this country," she told the youths. Rev. 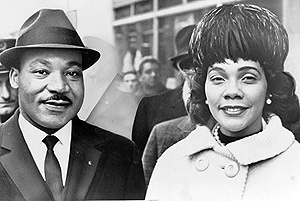 and Mrs. Martin Luther King in 1964. "Don't lose respect for yourself. This may be a new beginning for you." The inmates -- 16 to 20 years, mostly African-American -- cheered Mrs. King and Belafonte. He led them in singing rock and calypso songs. The program was performed twice to accommodate the facility's inmate population in two shifts. During the break between the two performances, Mrs. King and Belafonte, speaking with reporters covering the event, called for reforms, both to provide alternatives to minority youths to prevent their turning to crime and, if incarcerated, to promote programs fostering their turning their lives around. Earlier in the day, Mrs. King attended ceremonies at City Hall where Mayor John Lindsay proclaimed Jan. 15th as Martin Luther King day in New York City. There as at Rikers Island, Mrs. King expressed the hope that her husband's birthday would become a national holiday. It did . . . sort of. President Ronald Reagan signed into law the legislation Congress passed in 1983 setting aside the third Monday in January as Martin Luther King Day. Some considered the actual birth date of Jan. 15th coming too soon after Christmas and New Year's season for yet another holiday. Attaching the observance to the third Monday of the month helped overcome opposition to the bill.